Raid is an Upcoming Bollywood Film in 2018, It is Action, Crime Film and Ajay Devgn, Ileana D'Cruz in lead roles. This film is Directed by Raj Kumar Gupta and Produced by Kumar Pathak, Abhishek Pathak. It is made under the banner of Panorama Studios, T-Series. 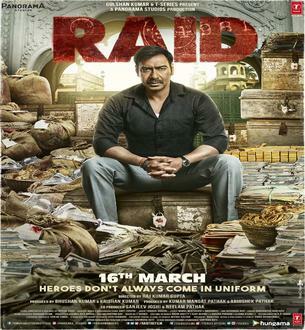 Raid is scheduled to release on 16 March 2018. Bollywood actor Ajay Devgan was seen in the role of the police officer in the film Singham and people liked this role. And this time, Ajay is seen as an income tax officer. Let's say that Ajay is playing the role of an honest officer in Devgan's upcoming movie 'Raid'. In which he will be seen raiding the houses of corrupt people.